THE majority of children in Bangladesh after five years in a primary school cannot read Bangla or English fluently and with understanding and cannot use the basic rules of arithmetic to solve an everyday calculation problem. This is the finding of independent assessments and those conducted by the government. You can verify it yourself if you walk into a classroom in a roadside primary school (after giving the head teacher a reasonable excuse for your being there!) with a Bangla language newspaper and ask at random a number of class 4 or class 5 students to read a story in the newspaper. What 80 percent pass in the last nationally conducted shomaponi (primary completion) examination means is seriously questionable. But this need not come as a surprise. A crowded primary class in many schools may have a hundred or more students with a hapless teacher struggling to carry on teaching. Total learning time in a year is less than half of the international average of about one thousand hours. Many teachers themselves lack an adequate grasp of the subjects they teach. The Ministry of Primary and Mass Education (MoPME) is engaged now in designing the next five-year phase of primary education development at the completion next year of the current Second Primary Education Development Program (PEDP II). It had a price tag of 600 million dollars. The next program is expected to be even more ambitious at least in its cost. A "pre-appraisal" mission representing the World Bank, the Asian Development Bank and potential bilateral donors have been in town to discuss the shape and nature of the next phase of primary education development. CAMPE, the civil society forum on basic education, which produces an annual Education Watch report on the state of basic education in the country, has been conducting studies and dialogue about needs and challenges in primary education. The political pledges of the government and the goals of the new education policy proposals have been a backdrop of this effort. The key elements which should find a place in the new primary education program have emerged form the public dialogue, as listed below. 1. A maximum class-size of 40 students (not an average class-size of 40); at least 750 hours of learning time per year for classes 1-3, and 1,000 hours for classes 4-5 to be achieved by 2015. 2. Appropriate numbers of teachers and classrooms to achieve the indicated class size and learning time. 3. Mid-day school meal through school managing committees and the union council in all schools as early as possible, but not later than 2015. School meal should have a priority over expanding stipends if a choice has to be made. *	Comprehensive upazilla-level assessment, mapping the status, and planning the need for provisions from preschool to grade 8 by 2015; this exercise should involve all providers, local government and communities, with the aim of making the education system truly inclusive and responsive. *	Much greater control and management of personnel, budget and implementation arrangements of the curriculum; adequate budget allocations and control of budget shifted to upazilla and school. *	Special dispensation regarding financial and personnel rules and regulations by the government to make the decentralization trial possible in the selected upazillas. 5. Develop a pre-school program for 5 year olds, based on 30,000 currently well-run preschools of NGOs which have standard curricular content, personnel training and supervision, and minimum standards for facilities and materials; rather than do it separately by the government by setting up its own system. 6. Develop the "second chance" program for children who may drop out or may not enroll, based on the successful and internationally acclaimed non-formal primary education (NFPE) of NGOs which is already serving effectively over a million children, rather than try to continue and expand the not very successful ROSC (Reaching Out-of-school Children) or a similar program of the government; the direct funding of NGOs or a consortium of NGOs and management of the program by NGOs can continue, under an overall agreement with the government. Don't try to fix it, if it is not broken. 7. A major curriculum development and capacity building effort should be undertaken with the National Curriculum and Textbook Board (NCTB) and involving in this MoPME, Ministry of Education, Madrasa Education Board and NGOs (offering second chance and pre-school). Textbook production and distribution should be separated from curriculum, textbook and materials development and placed with different organisations. Core competencies and core curricular materials development, curriculum articulation within the primary stage and for all of school education, and realistic curricular load and effective implementation; and continuing research, trial and capacity building for these tasks should be given due attention. 8. Institutional mechanisms involving academic and research institutions should be developed for assessment of key competencies at "key stages" (at grade 3 and 5 levels). Effective formative and summative assessment of learning linked to competencies and learning materials should be introduced. Research and capacity building for this purpose have to be undertaken. The primary education system should begin to prepare for participation in international assessment of learning achievements, such as Progress in International Reading Literacy Study (PIRLS) and Trends in International Mathematics and Science Study (TIMSS). 9. A major teachers' initiative should be in the program which will require MoPME and MOE to work together; a short term, medium term and longer term view must be taken for this purpose. Huge numbers of teachers needed for ensuring minimum acceptable standards for provisions; status, professionalism and remuneration of teachers to make it a coveted occupation, and introducing a proper pre-service teacher education program must be the main considerations. Short-term: All newly recruited teachers must go through a short induction of 3-4 weeks followed by continuing supervision/support/refresher for at least two years, a la major NGOs offering NFPE. This part of teacher training can be carried out with the cooperation of the major NGOs which are implementing a successful model and has the capacity to undertake such a job. Longer-term (10 years): A pre-service education course concurrent with college degrees should be introduced in 100 degree colleges. Bright young people should be attracted with full stipend and pledge of proper status and salary for a minimum of 5 years of service. The graduate can be inducted into a prestigious teaching service corps. The selected colleges themselves must be developed to meet minimum standards. Academic institutions such as IER and IED should be involved in curriculum and faculty development of the pre-service program. In the longer term, PTIs, NAPE and upazilla Resource Centres for primary schools (URCs) would be responsible for the huge job of continuing inservice education of teachers. 10. 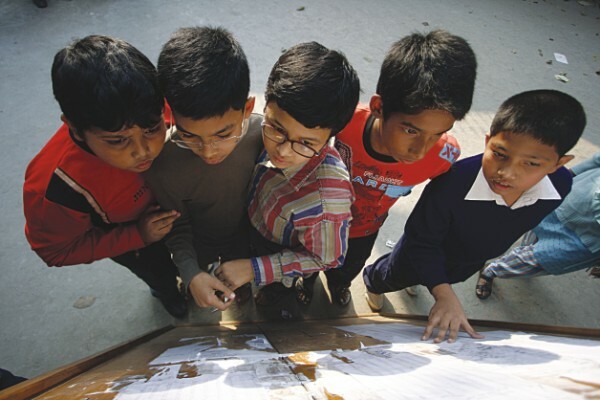 Infrastructure development: upazilla wise planning is necessary for ensuring adequate classrooms, toilets and water, playgorund, boundary walls, electricity, and proper maintenance. A trial of School Managing Committee (SMC) and Union Council responsibility for construction repair and maintenance should be introduced (including in upazillas for decentralisation trial). 11. Headmasters should be the academic and educational leader in the school and the community. Qualified ones meeting criteria should become Class II officers with drawing and disbursing authority. There should be provision for lager schools with a large staff and student body to have class 1 officers as headmasters. 12. Schools should be linked with rural IT centers, URCs and community learning centers for introduction of IT opportunities and reading rooms for teachers and students. PPP principle should be invoked to involve IT and Mobile phone operators to "adopt" and support schools. 13. An initiative for improving ibtidayee madrasas and ibtidayee sections of alia madradas with a revamped madrasa education board should be started. 14. Adequate budgetary resources should be available to support the minimum acceptable quality standards in line with the draft education policy recommendations and government pledges. upazilla-wise capitation grant based on student population and ensuring minimum standards in all types of institutions should be the goal. Donor support should be based on the principle of budget support to bridge the resource gap with monitoring and reporting for progress, focusing on agreed output/outcome indicators. A national steering committee for the program should have high level inter-ministerial, NGO and academic/research institution representation; it should be active and engaged in policy-setting, making broader decisions, and should consider setting up sub-committees or task forces for main implementation areas; the task forces can be more closely engaged in guiding the implementing bodies. If all these look complex and too ambitious, we should consider the cost of wasted lives of children and the consequences for the nation's future. Dr. Manzoor Ahmed is senior adviser at Institute of Educational Development, Brac University.